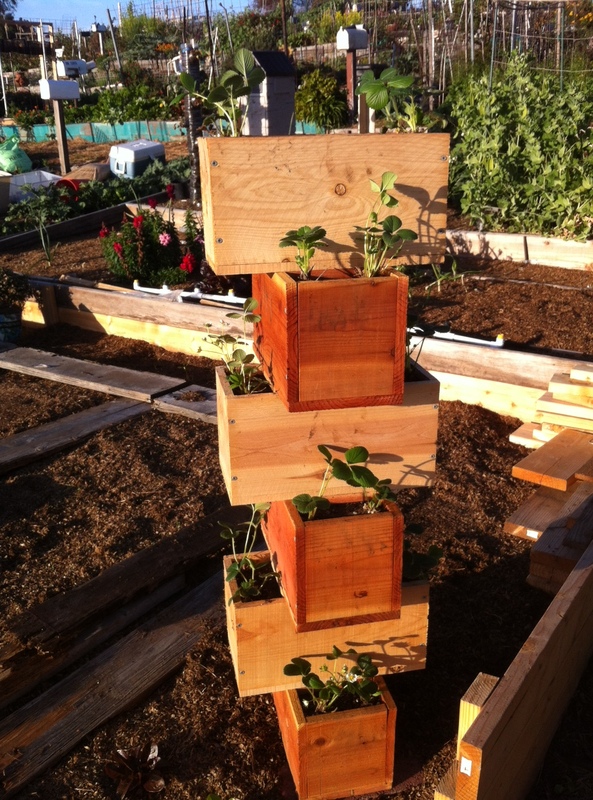 We built a stacked redwood and cedar planter strawberry tower over the weekend to give vertical gardening a try. (Planter details will be in another post). We used both redwood and cedar planters to see which one would hold up better. Both are insect and rot resistant and the contrast between the red redwood and white cedar looked nice. Planter dimensions are 15×7.5×7.5inches. The bottom of each planter has 11 0.5inch drainage holes to allow water to exit the planters. The planting mix we used was 1/3 screen compost (from the community garden), 1/3 organic potting soil and 1/3 organic azalea mix since strawberries like slightly acidic soil. 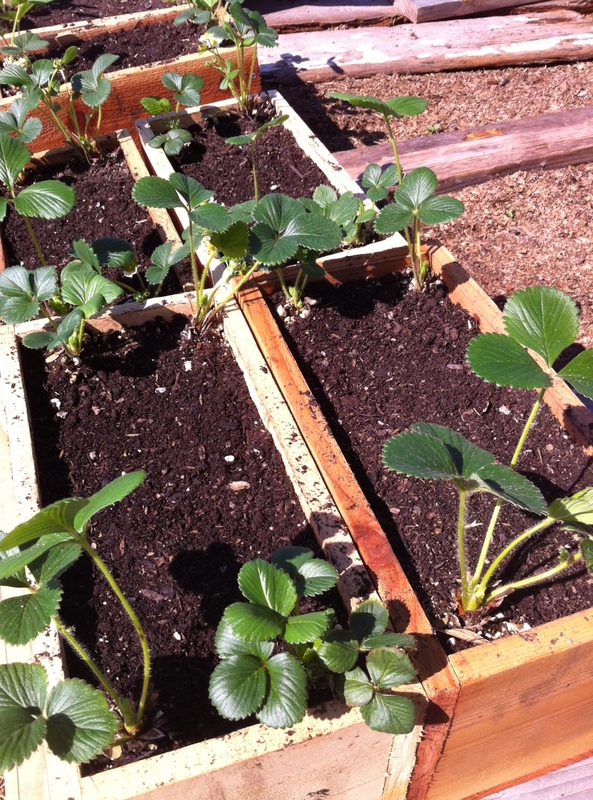 The strawberry varieties we planted were “Seascape” and “Sequoia”. Be sure to check which strawberry varieties do best in your area before planting. 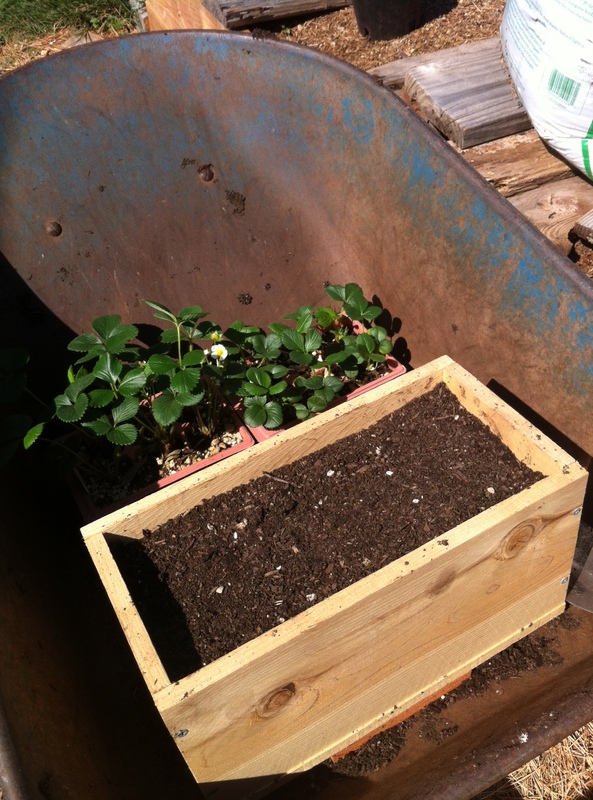 We started by filling each planter with soil mix and then lightly tamping the soil down to remove air pockets. The final height of the soil was 0.75 inches from the top of the planter. The lower soil level makes it easier to water the plants and it also prevents the soil from being washed out during watering. It also allows us to add a layer of mulch to help retain soil moisture. After all of the planters had been filled, we used a hand trowel to dig a shallow ditch on one side of the planter (1.5-2 inches deep) to plant the strawberries. 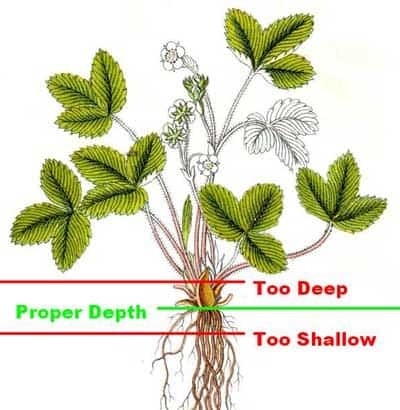 Ideally the strawberries should be planted so the soil level is even with middle of the crown (here is a good picture that shows proper planting depth). 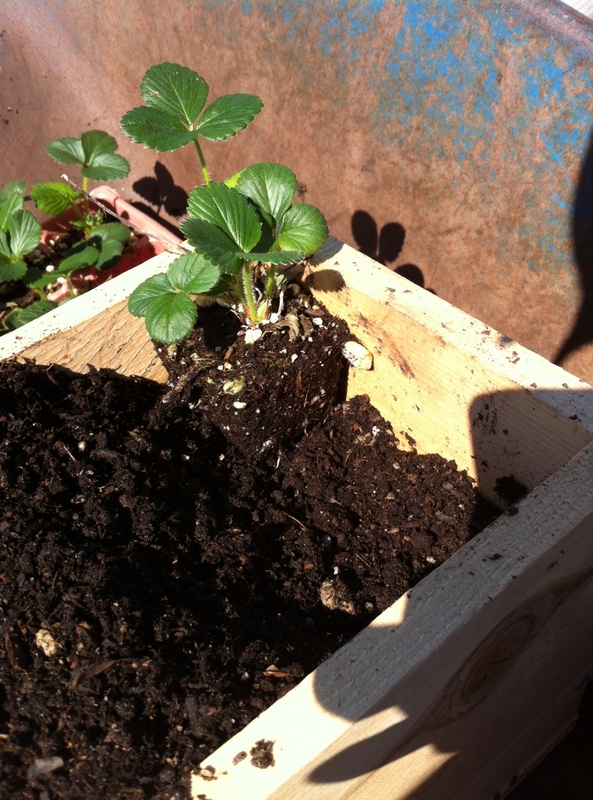 Since we purchased strawberries that were in 6-packs, we just has to make sure that soil level in the planter matched the existing soil level on the strawberries when we planted. If you wanted to plant bare-root strawberries, you would have to dig a slightly deeper hole to give the roots room to spread out. After placing the strawberry plants in to the hole, we gently filled the soil in between the plants and lightly tamped to remove large air pockets. 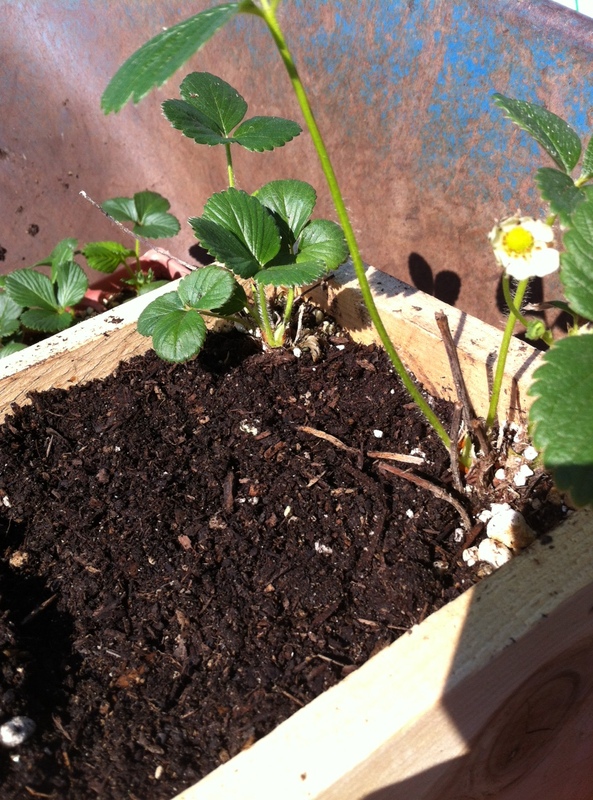 We planted two strawberry plants on each side of the planter for a total of 4 plants per planter (one in each corner). We also interplanted the two varieties just to mix things up. The strawberry tower is supported by a 6ft metal t-post driven about 1.5 ft in to the ground where the planters cross (behind the planters so that the wind will blow the planters in to the post). The bottom planter was set on two patio pavers to allow for better drainage and to provide a level base for the tower. It is very important to have the base level the all directions before stacking, otherwise the tower will be unstable. Finally we stacked the planters on top of each other, alternating directions so the boxes formed an “X” pattern. Then we gave the planters a deep watering to help them establish deep roots. What a great use of limited space. I would love to try this on my balcony.